This Seca 750 mechanical dial flat scale offers both rugged durability and a large, easy-to-read dial. Its design was based on a lower profile and a wider platform. 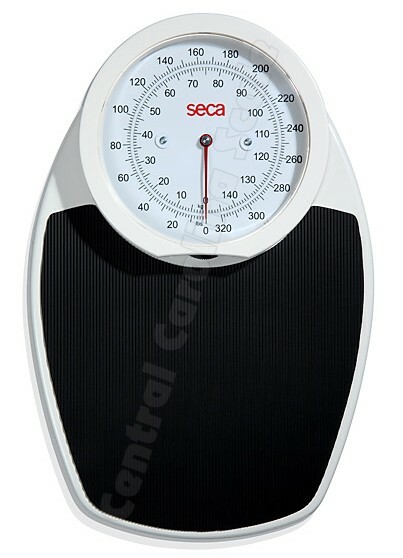 Seca 750 Scale is pretty and stable: with its pure, light design, these scales will make a good impression in any clinic. A stable, powder-coated steel casing, a circular display and an easy to clean tread area of black imitation leather – what more does one need for comfortable weighing? Choose between pounds only display or a pounds / kilograms display. The seca 750 is well-suited for pharmacies and fitness studios, as well as hotels, nutritional counselling centers and private households. Extremely durable with powder-coated steel casing. 12.5 x 4.5 x 18.5"
Stable and roomy mobile case for all flat scales.